Have a browse, add a case to your basket and checkout! Or if you're a techno-phobe, live chat with us and we'll place an order for you. We ship in cases of 6 and any number of bottles between 12 to 18 - and delivery is FREE if you spend £100 or more. N.B. Voucher spend doesn't qualify for free delivery i.e. you have to spend £100 of your own money. We can add a gift message and specific delivery instructions to your order. Just add these on the checkout page. N.B. During particularly busy times, we may not be able to ship in cases smaller than 12, to ensure we get as many wines as possible out to our Angels. Please remember that all of our wines are covered by our 100% money-back-guarantee. We accept Visa, Mastercard, American Express and Maestro. Please make sure your billing address matches the address your bank holds or we won't be able to verify your card. How do I know what wines to pick? Still not sure what to go for? Live chat with one of our friendly Wine Advisors who will bespoke you a case to match YOUR taste-buds. Why does every wine / case have two prices? Non-Angels pay the normal price and our Angel members pay the Angel price. The normal price reflects the price of the wine if it were to be sold via a different retailer (i.e. its high-street value). The Angel price reflects the power of Angel funding! 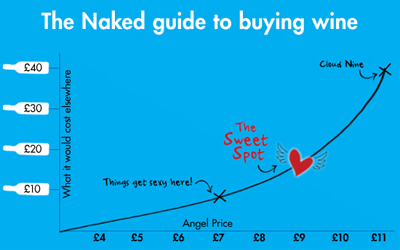 Our Angels invest £20 a month into their Naked piggy-bank towards future orders, in return for 25%-50% off every time they order. Why the discount? By investing in their wines upfront, we're able to fund talented, independent winemakers - cutting out a raft of 'dead' costs. So it's only fair our Angels get passed the savings! Why don't I recognise the labels? All of the wines we stock are exclusive to Naked Wines - so you won't see a bottle of Blossom Hill or Hardy's popping up anywhere. Our wines are exclusive because our Angels have funded them. They're invested in the wines before they've been made - meaning we secure all the spoils. If you're wondering if the wines are any good, the proof is in the pudding. Give them a try and if you don't love them, we'll give you all your money back! Why are some of your wines bottled in Germany? We bottle some of our entry-level wines at a bottling facility in Germany. How does it work? The winemaker loads their wine into a 'flexitank' (basically a giant, wine-filled balloon!) which sits in a shipping container. Does it affect the quality of the wine? Not at all. In fact due to advancements in tanker technology and quality, the wine is less prone to temperature variations during shipping - so the wine can actually arrive in better condition than bottled wine. Does it have any environmental benefits? By more than doubling the amount of wine that can be shipped, bulk shipping seriously reduces the environmental emissions associated with transport. For example, each flexitank from Australia bottled in Europe reduces CO2 emissions by 20 tonnes, otherwise associated with the weight of the glass bottles the wine is in. Do our winemakers approve? Absolutely. Bottling is a winemaker's biggest headache and they're perfectly happy to hand the job over to our ruthlessly efficient German friends. They have all visited the bottling line and are kept fully up to date on the wine's progress at every stage. Sure, it doesn't sound romantic, but some of our highest-rated wines are bottled in this way so there's clearly no impact on quality. What if I don't like the wines? If you don't like the wines we'll give you your money back, so there's absolutely nothing to lose! To arrange a refund, the best way is to live chat with us or pop us an email to help@nakedwines.com. Our standard delivery service is next day (Monday to Saturday) to most UK addresses, when you order before 5pm. The delivery charge is £4.99 or it's free if you spend over £100. If you don't want your wine to be delivered next working day, you can select a delivery day up to 5 days in the future at checkout. We also offer delivery before noon on Saturday through a signature-required service £6.99. Occasionally we might bring the 5pm cut-off forward. If in doubt, just check the count-down clock at the top of the page. Please note that some sale cases may be exempt from free delivery (which we'll make clear on the website). Similarly if you're using a voucher or a gift card to buy your wine, or claiming a free bottle, you have to spend £100 of your own money to qualify for free delivery. Alternatively we offer a Click and Collect service to 213 Majestic stores. Click and Collect delivery is free, except if you're a new customer purchasing a discounted case. You'll have up to 5 working days to collect your wines once your order has been delivered to your Click and Collect location. We deliver to most UK addresses - but we're unable to make deliveries to JE or GY postcodes, and we cannot deliver to Parcel Motel, DPD Parcel Wizard or AddressPal/AirBusiness locations. Also, our standard next-day delivery service does not apply to certain postcodes. Please see below for a list of exceptions - and please note that we don't offer Saturday morning delivery to any of the postcodes listed below. Our delivery company will leave your wine in a safe place if you're not in (please leave instructions at checkout - but please note that our courier won't leave your wine box by the bins, just in case it's bin day!). And IF your wine gets nicked or damaged, we'll replace it free of charge. Alternatively, you can Click & Collect from your local Majestic store. If there's been a delay or problem, hopefully our proactive delivery team have already been in touch! If not, please live chat with us or give us a call on 01603 281869 (Mon-Fri 9am-5:30pm, Sat 9am-1pm). How do I track and make changes to my delivery? You can track your order and request changes to your delivery using the link we'll send you in your order confirmation email. To arrange a refund, the best way is to live Chat with us or pop us an email to help@nakedwines.com and we'll get it sorted for you. How do I claim a voucher? To claim your voucher, click here - and enter your code, password and email, then hit the 'claim now' button. The case we offer on the confirmation page is always the best deal, but feel free to browse the site and pick another case (OR build your own). The recommended case will always be there, right on your homepage. N.B. Most of our vouchers have a minimum spend and you'll find all the blurb on the voucher itself. If for example, you have a £60 voucher with a minimum spend of £99.99, you need to add at least £99.99 worth of wine to your basket before your voucher will be deducted. For full voucher T&Cs and our fair usage policy please click here. Most of our vouchers are for new customers only - if this is the case, it will be shown on the voucher. You cannot use more than one voucher per order. As above, the majority of our vouchers are for new customers only, to encourage them to give us a test drive. As an Angel, you get a 25% to 50% discount on ALL your orders and access to exclusive Angel wines! How can I access my account and update details (cards, addresses etc)? You can also see a full break-down of transactions and how much you've spent here. How can I update or set a new password? If you're logged-in and you simply want to update it, visit your My Account page. Where do I add a profile picture? You can add a profile picture on your My Account page. This means that all the other Angels will be able to see your beautiful face when you post on the site! What's my Naked Me page? Your Naked Me page is all about you! It displays your last order so you can rate your wines - and it displays your wall, so you can find out what others have been saying and reviewing. There's a filter at the top of your wall, so you can filter by your own posts, by your winemakers' posts - and various other useful things! How can I look into previous orders? To view previous orders, you can either visit your Account History page - or your can visit your My Wines page. On your My Wines page, there's a filter at the top which you can use to look at specific orders. Where can I see all my wines? All of your wines are listed on your My Wines page. There are various useful filters at the top of the page so you can delve into them. This page also includes personal recommendations, based on your ratings and reviews! Are the Angel payments flexible? Absolutely! Our Angel payments are very flexible and the money you pay into your account is always yours. You can change the amount you pay in to any multiple of £10 by visiting your Angel account page (please scroll down to the bottom). To read our full Angel T&Cs please click here. If you do cancel, we'll refund any unspent money you've paid in. What's a Naked Wine Angel? Angels are a very special group of people who support talented winemakers by saving £20 a month towards their next order. In exchange, they save at LEAST 25% (and up to 50%) every time they buy. And they get access to a whole host of other benefits such as a FREE premium bottle every month if they order a case, access to exclusive wines - and invitations to exclusive tasting events. Click here to find out more and join the waiting list. PLUS, we never send you wine without being asked. This is not one of those dodgy wine "clubs" you can never get out of! We invest your cash (at no risk to you!) in discovering and funding new and exciting wines and winemakers. Often, because we know our Angels are ready and waiting with cash to spend, we tell a winemaker we'll buy their entire production of a wine, which drives the price down - a saving we pass on to you. We also use it to help fund better grapes, barrels, or bottling. Whatever it is, you can be sure it's helping you drink better wines, for less money! Yes, you can ask us to refund you any unspent balance whenever you like. And in case you were wondering; the funds are protected by our ultimate parent company guarantee so that if anything goes wrong with Naked Wines your money remains secure. You can join the waiting list to become a Naked Angel here. How do I claim my free monthly Angel sample? We'll email you at the start of every month (usually in the first week) to let you know that your free monthly Angel sample is in your basket. If you can't see it, please make sure you're logged-in - and if you delete it from your basket by mistake, you can re-add it from your Naked Me page. To claim it, all you need to do is add 12 other bottles to your basket and checkout as usual. N.B. If you really don't like the look of any of the swap options, live chat with us or drop us an email to help@nakedwines.com and we'll try our best to replace it with something you do like, of a similar value. How can I rate and review my wines? All of your wines are listed on your My Wines page - where you can give them a thumbs up or thumbs down. We'll invite you to leave a more detailed review, but it's entirely up to you! Your most recent order will also be listed on your Naked Me page - and you can leave your feedback there too. Every time you rate a wine, it helps the winemaker out and it helps us out - as we know where to invest your money! It also means we can recommend you other wines we think you'll love (click on the 'Wines recommended to me' link under the 'My Wines' filter). How can I chat to other customers? There are various walls dotted around the site where you can log in and post questions and chat to other Angels. A good place to start is our Groups homepage, where you can join our most popular discussion groups. Don't be shy! How can I follow other customers? If you want to follow another customer, simply click on their name and a little pop-up will appear with a follow button. Once you follow someone, their wine reviews and wall posts will appear on your Naked Me page, so you can find out what they've been drinking (a great way to discover new wines). Where can I see which groups I belong to? Simple. Click here to visit your My Groups page (if you hover over your name at the top of the website, you'll see a drop-down menu with the permanent link). How can I chat to the winemakers? Each winemaker has their own profile page with a wall. All you need to do is log-in and get posting! You can see a list of all the winemakers we support here. How can I follow a winemaker? On each winemaker's profile page there's a green 'Follow' button. Log-in and give it a click! By following them, you'll be the first to hear about new wines and what they've been up to in the vineyard. This is our "buy it again" rating – a quick and easy way to see how popular a wine is. The percentage is the number of customers who’d definitely come back for more, over the number of customers who have left a rating. The rating starts afresh every vintage, to help you identify a particularly good year! We previously showed a combined percentage for all vintages past and present – with the new system you can hover to see how the previous vintages were rated in comparison. More importantly, the old system worked brilliantly for popular and 'safe' styles of wine like New Zealand Sauvignon - but it could make or break the marmite wines such as Torrontes or Northern Rhone Syrah. So the good news is, Eamon and Ray (our wine guys) can head further off the beaten track - and continue to introduce new and obscure wines to the shelves. And we can continue to pop the odd marmite wine in our premixed cases to encourage customers to step outside of their comfort zone! How can I recommend a friend to Naked Wines? Visit our Invite a Friend page where we'll have a cheeky little deal for you to pass on to your friends. I have been invited to join Naked Wines by a friend. What will you do with my data? Angels have the opportunity to invite their friends to join Naked Wines. If you have been invited, we'll send you an email with an offer, and 1 email reminder. If you don't claim the offer, we'll remove your information from our database after 30 days. What's Naked MarketPlace and who is it for? Because you can't really plan for when winemakers suddenly need help, there isn't a list of upcoming deals. But we'll post in the MarketPlace group or send an email when there's one on the horizon. If you like the look of the deal, click on the 'BID NOW' button to place a bid for a case. If the winemaker reaches the minimum number of bids, then the deal is on! We'll take payment when the pitch ends, and deliver your wine when it arrives in the UK (see estimated delivery date on the pitch detail page). What does Naked Wines get out of it? Naked Wines charges winemakers a flat 10% commission i.e. ALL your money (minus our commission, the tax man's cut and shipping costs) goes directly to the winemaker. How do I know the discounts are genuine? The RRP price is the price you would have to pay if it was on sale elsewhere in the UK. Is it cheaper than buying wine in the supermarket? Probably. Our margins are certainly lower than the supermarkets - so you should get a lot more wine for your money. How do I know if the wine's any good? We've tried the wines and stand by their quality. And if you don't like them, we'll give you your money back. Why do I have to wait for my wine? To get the best possible price, we ship the wine directly from the winemaker to your door. So you have to wait until the minimum number of cases are sold and the deal is done. Once you've got your wine, you'll forget about the wait! How do the email notifications work? To make sure you’re first to hear about MarketPlace deals you’ll need to subscribe to the email notification list by visiting www.nakedwines.com/marketplace and entering your email address. If you’re a new customer, we’ll add you to the MarketPlace list for 2 years. If you don’t place an order in that time, we’ll delete your data from all our systems. This is to make sure it’s kept 100% safe. If at any time you want to unsubscribe from the MarketPlace email notification list, just click the unsubscribe link and enter your email address at www.nakedwines.com/marketplace or email help@nakedwines.com. When will I know if my bid's successful or not? We will email you at the end of each deal to tell you whether you've secured your wine or not. N.B. Each deal runs for a week, and you can check the end time against each deal. We will debit your registered Naked Wines' credit / debit card when the pitch ends (OR we will use any cash in your Naked Wines' account) and ONLY if you've secured your wine. Yes! The price you bid includes delivery to your door. We deliver to most UK households - and we'll deliver to the default delivery address on your account unless you tell us otherwise. Can I pick a delivery day / time? No but we will email you about a week before delivery to let you know when it's arriving. What if you leave it outside my house and it gets nicked or damaged? We will give you a full refund (but we won't be able to replace the wine because the winemaker will generally only deliver the amount of wine ordered). Are there Angel discounts on these cases? Nope. Most of these wines are already made and already have HUGE discounts - so they don't need Angel backing. We therefore don't want to compromise the Angel scheme by adding additional Angel discount. Are these deals better than the Angel deals? Should I stop being an Angel? It's like comparing apples with pears i.e. they're two very different deals! As an Angel, you can invest in independent winemakers who need a helping hand, in return for at least 25% off and next day delivery. With Naked MarketPlace, you can pre-order wine that's already been made, at a very good price - by negotiating directly with the winemaker, so there's no reason why you can't do both! N.B. From time to time, we will use the MarketPlace to raise cash for winemakers who need your support. As a business, is Naked Wines still supporting small, independent winemakers? Definitely. We will continue to support and fund independent winemakers, in return for exclusive wines at preferential prices - for YOU. Our WineWizard service is the wine club for people who hate wine clubs… and don't have the time to browse and build their own cases. Signing-up to our WineWizard service guarantees you a bundle of seasonal wines, delivered to your door every 1, 2 or 3 months. You decide how often. The wines are picked to match your tastes - and you tell us how many bottles you want (12, 15 or 18) and whether you want red, white or mixed. Nope. Not at all. We'll email you roughly 7 days before each case is due (confirming the wines and the price), and if the timing's not right, you can postpone or skip your order - or cancel all together. It depends which case you pick - but most importantly, you're in control! As above, we'll let you know c. two weeks before each case is due - and you can postpone or skip if the timing's not right. The price of the case (which is always better than the Angel price) will be debited from your registered credit / debit card when each case is shipped. Or if you have any Angel balance sitting in your account, we'll use that up first (excluding any vouchers, which cannot be used towards Wine Wizard cases). If you don't like the look of any of the wines in the case, we'll suggest some replacements we think you will like - and we'll update your case before we ship it to you. Plus, all of the wines are covered by our money back guarantee i.e. love 'em or get a refund. Not a bean. They're Naked enthusiasts who get stuck in for the love of Naked. How do I become an Archangel? Take a look at our Archangel page here and see if you fit the bill. If you're keen, there are details on how to apply. It’s a curated service designed to make sure you have a wine rack full of wines you’re going to love, when you want them - and you only pay us when we get it right. Not at all - you can tailor Wine Concierge to suit you by choosing how often you want each delivery, how much you want to pay per bottle, and of course by telling us what you think of our wines by selecting whether you’d buy them again via our website or app. By letting us know what you think, you’ll help us make better and better recommendations for your next selection. And if you decide you don’t want to make a regular commitment, you can skip or cancel Wine Concierge at any time. You can choose the price of your Wine Concierge cases when you sign up to this service – and if any of the wines don’t knock your socks off, just tell us what you think of them online or via our app, let us know, and we’ll pop a credit on your account. If we’ve offered you our try before you buy service, you’ll have 30 days from the point of ordering to use our app or website to tell us if you’d buy your wines again or not before we charge you – and we’ll only bill you for the wines you enjoy. If you don’t tell us what you thought of any of your wines before the 30 days is up, we’ll charge you the price you were shown at checkout for all the wines you purchased. N.B. we won’t be able to confirm how much you’re due to pay for your try before you buy case until the 30 days is up, but we’ll give you a heads up that we’re about to take the payment a day before we charge your card. We’ll charge you for each case when your wines leave our warehouse. N.B. If we’ve offered you our try before you buy service, you’ll have 30 days from the point of shipping to pop online or use our app to tell us which of your wines you’d buy again before we charge you – and that’ll make sure we only bill you for the wines you love. All our wines are covered by our commitment that you should only pay for wines you love. If you don’t, just tell us what you thought - would you buy them again, yes or no - online or via our app, then let us know, and we’ll pop a credit on your account. As above, if we’ve offered you our try before you buy service, you’ll have 30 days from the point of shipping to pop online or use our app to tell us which of your wines you’d buy again before we charge you – and we’ll only bill you for the wines you enjoy. If you discover a bottle you don’t get on with after the 30 day period, just let our Customer Happiness Team know and we’ll pop a credit on your account for next time. How is this different to WineWizard? Over time, Wine Concierge will learn what really tickles your tastebuds based on what you tell us via our website or app, and will make better and better choices for each case - so you get the time saving of having us prepare a case on your behalf AND a bespoke selection built just for you. Will my Angel free sample be included in my Wine Concierge cases? Wine Concierge saves you time by putting together a case based on your tastes and preferences. Monthly Angel free sample offers are intended to introduce you to winemakers and kick start your choices when you put together your own case. As such, we don’t include Angel freebies in Wine Concierge cases that we put together on your behalf. As an Angel, you’ll still be offered a free sample every month - and keep all your other perks - so you’re very welcome to add your Angel freebie to non-Wine Concierge orders as usual. Give us a call on 01603 281869 or Live Chat with us and we’ll get everything set up for you. What is your phone number and when are your opening hours? Our phone number is 01603 281869. What's your email address and how quickly will you respond? Our email address is help@nakedwines.com and we'll aim to reply to all emails within 24 hours Monday to Saturday. We do. The opening hours are (Mon-Fri 9am-5:30pm, Sat 9am-1pm). Please click here to start a chat. We pride ourselves on having a positive work environment here at Naked, and this extends to our interactions with you, our customers. We’ll always treat you with the utmost respect, and do our level best to fix anything that’s gone wrong. To help us do this, we ask that you treat our team with that same patience and respect.